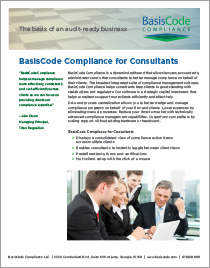 BasisCode Compliance developed a groundbreaking regulatory compliance management system geared specifically for compliance consulting firms. Our consulting software expands upon our award-recognized risk mitigation software developed originally to help financial and insurance providers manage their compliance programs more effectively. 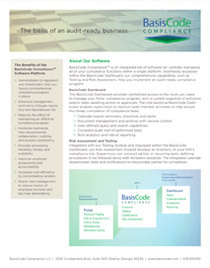 BasisCode Compliance Consultant Manager standardizes service delivery and management of regulatory compliance programs while simultaneously providing consultants the ability to customize services on a client by client basis. It simplifies day-to-day functions and adds transparency to client processes and services resulting in improved profitability. Clients want to know that their consultants are efficiently delivering the service in an easily reportable format at the time of examination or audit. Our web-based portal allows consultants to collaborate with individuals and organizations easily and securely, creating transparency and strengthening client relationships. BasisCode also provides the opportunity for consultants to participate in a cafeteria type program to advertise their compliance products and services to existing BasisCode clients. 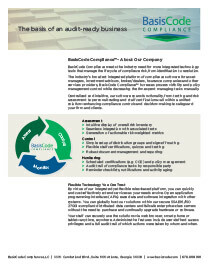 The BasisCode Marketplace allows users of BasisCode Compliance to view the profiles, products, and services of participating consulting firms, and engage with them directly.